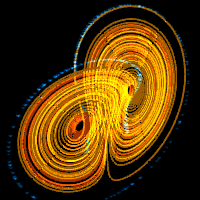 A so-called orbit trap is a geometrical object in the complex plane that is used to generate a fractal. 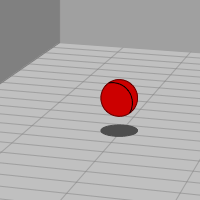 In the interactive examples below, a point, a cross, a square, or a circle, are used as orbit traps. 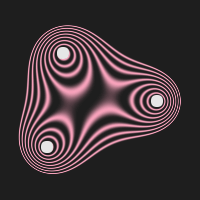 When using an orbit trap to generate a fractal, the fractal is formed of (in theory infinitely many) distorted copies of the original orbit trap. 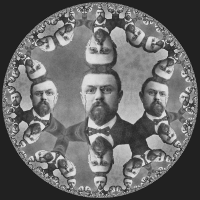 Click in either fractal canvas to pick a new Julia point or to zoom in. 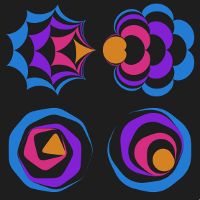 Change the orbit trap and then click on "Generate new fractals". Choose one of the orbits: point, cross, square or circle. 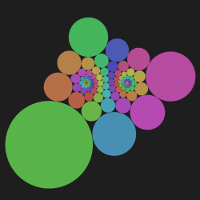 Change the size of the orbit trap (this has no effect if the shape is a point). Pick a new position for the orbit trap by clicking in the dark canvas. 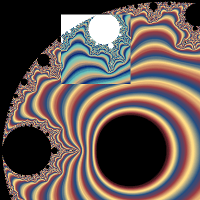 For a short introduction to the Mandelbrot set and Julia sets see Mandelbrot and Animate Julia Sets. 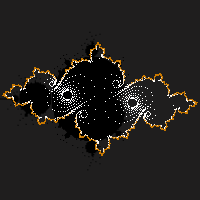 When using an iterative function to generate the Mandelbrot set or a Julia set, each iterated point will be generated along a so-called orbit. 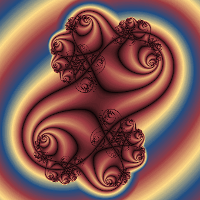 A straightforward way to generate the Mandelbrot set or a filled-in Julia set, is to iterate until the distance to the origin is larger than 2, where the point escapes (it is certain that it will diverge if the iteration continues). 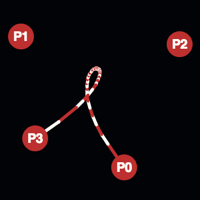 The number of iterations until a point escapes, or the angle of the point at the escape-time, can be used to choose a color from some palette. 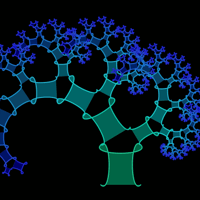 When using an orbit trap, instead of the escape time, the distance between the trap and the orbit of a point is used to colour the fractal. 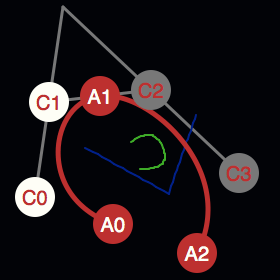 When iterating a point along its orbit, the distance to the orbit trap from each point on the orbit is calculated, then the minimum distance is used to colour the original point. 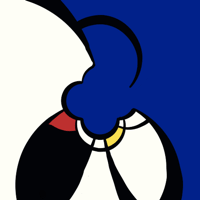 The iteration continues for a fix number or steps, or until a point on the orbit gets sufficiently close to the trap - in which case the orbit gets trapped. 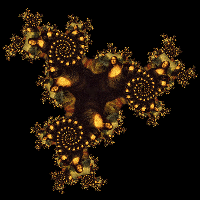 Mandelbrot christmas tree on tumblr. 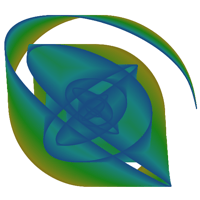 More information about orbit traps can be found at Inigo Quliez: geometric orbit traps.